The growing, harvesting and handling of our olives is done as it has been done for centuries, with no commercialization or commingling with inferior products. This is truly an “all-natural” product. To be identified as “Extra Virgin,” an olive oil must have an acidity below 0.8%. 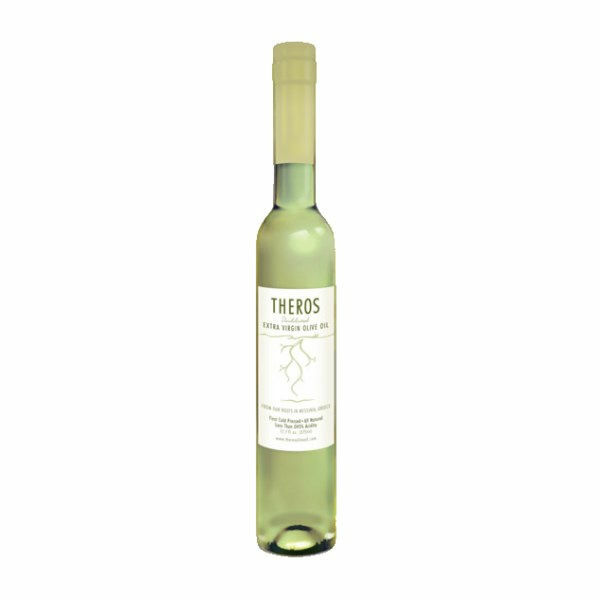 Theros Olive Oil not only meets this standard, but greatly exceeds it, always carrying an acidity of 0.45% or lower – half that of other common retail brands. Why is low acidity important? In a word: Purity. Higher acidity is the result of commingling with impure product, chemicals or preservatives. Theros Olive Oil never employs such practices. This is 100% pure, unblended, beyond-Extra-Virgin oil. Try it and the difference will be apparent. 100% Pure. For olive oil, a critical measure of purity is the acidity level. The “Extra Virgin” classification requires less than 0.8% acidity. Theros Olive Oil always carries an acidity of 0.45% or lower – half that of other common retail brands. Completely natural. Our oil is first cold pressed – meaning no chemicals or other additives are used to transform our olives into the oil you purchase. Only natural pressure is used, yielding a higher-quality, all natural oil. Directly from our family to yours. Among connoisseurs, it is well known that the best olive oils come from small producers who control their product from beginning to end. This is the way Theros Olive Oil is brought to you; from our olive tree groves, to our harvest, to our olive pressing, to importing, bottling, labeling, and shipping – every facet of our production is handled by our family. No middlemen, no corporate intervention...simply the fruits of our labor prepared and sent directly to you. Trans-fat free. No additives, preservatives or other products are commingled with our oil. There are no trans fats…nothing other than the purity of what comes from our olives. Ultra-fresh. What you buy from us today was literally growing in our olive tree groves within the past year! As described in our harvesting process, because everything we do is completely natural, we are able to bring this oil from our land to your home with ultra freshness. A family affair. We take enormous pride in what we do. Ours is truly a family endeavor, with members of the Theros family working hard to bring the best, highest-quality oil in the world to you and your family. A premium olive oil such as ours does not need to be refrigerated after opening. In fact, it will remain at a high quality level when stored in a cool, dark place for six to twelve months. Our oil should be stored in an air-tight container; simply keeping it in our bottle with the cap tightly secured will do the trick. Due to the oil being packaged in a clear bottle, be sure to store in a cool, dark location for maximum freshness.